Fermilab is an enduring source of strength for the US contribution to scientific research world wide. This schematic shows the experimental setup for the dark matter search. Protons (blue arrow on the left) generated by the Fermilab accelerator chain strike a thick steel block. This interaction produces secondary particles, some of which are absorbed by the block. Others, including photons and perhaps dark-sector photons, symbolized by V, are unaffected. These dark photons decay into dark matter, shown as χ, and travel to the MiniBooNE detector, depicted as the sphere on the right. Particle physicists are in a quandary. On one hand, the Standard Model accurately describes most of the known particles and forces of interaction between them. The Standard Model of elementary particles (more schematic depiction), with the three generations of matter, gauge bosons in the fourth column, and the Higgs boson in the fifth. On the other, we know that the Standard Model accounts for less than 5 percent of the universe. About 26 percent of the universe is composed of mysterious dark matter, and the remaining 68 percent of even more mysterious dark energy. Some theorists speculate that dark matter particles could belong to a “hidden sector” and that there may be portals to this hidden sector from the Standard Model. The portals allow hidden-sector particles to trickle into Standard Model interactions. A large sensitive particle detector, placed in an intense particle beam and equipped with a mechanism to suppress the Standard Model interactions, could unveil these new particles. Fermilab is home to a number of proton beams and large, extremely sensitive detectors, initially built to detect neutrinos. These devices, such as the MiniBooNE detector, are ideal places to search for hidden-sector particles. In 2012, the MiniBooNE-DM collaboration teamed up with theorists who proposed new ways to search for dark matter particles. One of these proposals [FNAL PAC Oct 15 2012] involved the reconfiguration of the existing neutrino experiment. This was a pioneering effort that involved close coordination between the experimentalists, accelerator scientists, beam alignment experts and numerous technicians. 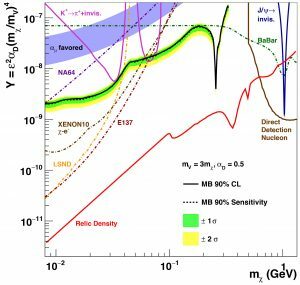 Results of this MiniBooNE-DM search for dark matter scattering off of nucleons. The plot shows the confidence limits and sensitivities with 1, 2σ errors resulting from this analysis compared to other experimental results, as a function of Y (a parameter describing the dark photon mass, dark matter mass and the couplings to the Standard Model) and Mχ (the dark matter mass). For details see the Physical Review Letters paper. For the neutrino experiment, the 8-GeV proton beam from the Fermilab Booster hit a beryllium target to produce a secondary beam of charged particles that decayed further downstream, in a decay pipe, into neutrinos. MiniBooNE ran in this mode for about a decade to measure neutrino oscillations and interactions. In the dark matter search mode, however, the proton beam was steered past the beryllium target. The beam instead struck a thick steel block at the end of the decay pipe. The resulting charged secondary particles (mostly particles called pions) are absorbed in the steel block, reducing the number of subsequent neutrinos, while the neutral secondary particles remained unaffected. The photons resulting from the decay of neutral pions may have transformed into hidden-sector photons that in turn might have decayed into dark matter, which would travel to the MiniBooNE detector 450 meters away. The experiment ran in this mode for nine months for a dedicated dark matter search. Using the previous 10 years’ worth of data as a baseline, MiniBooNE-DM looked for scattered protons and neutrons in the detector. If they found more scattered protons or neutrons than predicted, the excess could indicate a new particle, maybe dark matter, being produced in the steel block. Scientists analyzed multiple types of neutrino interactions at the same time, reducing the error on the signal data set by more than half. Analysts concluded that the data was consistent with the Standard Model prediction, enabling the experimenters to set a limit on a specific model of dark matter, called vector portal dark matter. 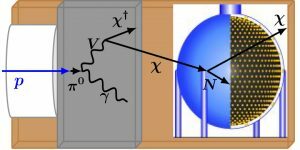 To set the limit, scientists developed a detailed simulation that estimated the predicted proton or neutron response in the detector from scattered dark matter particles. The new limit extends from the low-mass edge of direct-detection experiments down to masses about 1,000 times smaller. Additionally, the result rules out this particular model as a description of the anomalous behavior of the muon seen in the Muon g-2 experiment at Brookhaven, which was one of the goals of the MiniBooNE-DM proposal. Incidentally, researchers at Fermilab will make a more precise measurement of the muon — and verify the Brookhaven result — in an experiment that started up this year. What’s next? The experiment will continue to analyze the collected data set. It is possible that the dark matter or hidden-sector particles may prefer to scatter off of the lepton family of particles, which includes electrons, rather than off of quarks, which are the constituent of protons and neutrons. Different interaction channels probe different possibilities. If the portals to the hidden sector are narrow — that is, if they are weakly coupled — researchers will need to collect more data or implement new ideas to suppress the Standard Model interactions. The first results from MiniBooNE-DM show that Fermilab could be at the forefront of searching for hidden-sector particles. Upcoming experiments in Fermilab’s Short-Baseline Neutrino program will use higher-resolution detectors — specifically, liquid-argon time projection chamber technology — expanding the search regions and possibly leading to discovery. Ranjan Dharmapalan is a postdoc at Argonne National Laboratory. Tyler Thornton is a graduate student at Indiana University Bloomington. collaborate at Fermilab on experiments at the frontiers of discovery.